It’s not something anyone likes to hear because flu symptoms are uncomfortable and inconvenient. Due to the viral nature of the flu, it’s also easy to spread to your friends, family, and coworkers. No wonder so many people are afraid of getting the flu. Now that flu season is upon us, more people are washing their hands, buying hand sanitizer, disinfecting doorknobs, and distrusting food workers who don’t cover their mouths when they cough and sneeze. And as a physician in Niagara Falls, you smile when you see that, because it takes preventative measures like those to keep people from getting infected. The flu spreads easily indoors, and with the colder winter months, we’re all spending more time indoors. Are you prepared for flu season? Or are you going to be out of commision for a week and potentially get the people around you sick too? According to Infection Prevention and Control (IPAC) Canada, this flu season is already setting records. More people became infected with Influenza between August 24 and September 21 than they have during those weeks in the past 15 years. Most people shouldn’t be afraid of the flu, though. After all, it’s a pretty common infection, and symptoms of the flu are easy to spot, flu remedies are readily available, and flu prevention doesn’t take that much effort — It does take some, though, and you have to know what you’re dealing with. Influenza A and B are the types most common in humans. According to IPAC Canada, Influenza A causes a “more severe illness” than Influenza B and is the strain that has caused worldwide epidemics (i.e. H1N1 and Avian Influenza). If you become infected, you’ll usually notice symptoms of the flu appearing between one and four days after you come in contact with the infection, and you’ll typically stay sick for 7-10 days. While less common, there are a few other types of “flu” that receive a lot of media attention. While Niagara Falls doctors don’t see as many cases of the following, it’s helpful for you to know what they are, so we’ll briefly mention them. Other viruses people commonly refer to as “flu” are H1N1, Avian Influenza, and viral gastroenteritis. H1N1 (swine flu) – The H1N1 virus, also known as “swine flu”, is a variation of Influenza A that circulates in pigs. In 2009, the virus caused a worldwide pandemic, but it is now a seasonal virus. 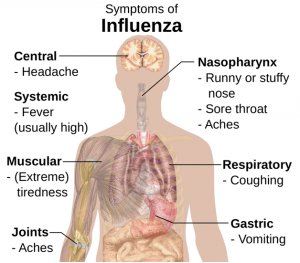 H1N1 symptoms are the same as those you’d experience with seasonal Influenza, and the symptoms last approximately the same amount of time as seasonal flu symptoms. Like seasonal flu, H1N1 spreads from person to person. H1N1 is one of the Influenza strains that the flu vaccine protects against, and the American Center for Disease control recommends a flu shot as the best preventative measure to take against this virus. It’s also important to note that properly handled pork meat poses no risk of spreading the virus. Keep eating bacon as you please. It’s delicious. Avian Influenza (bird flu) – Avian Influenza, commonly known as “bird flu” is caused by a type of Influenza A viruses that spreads rapidly among birds. In most cases, these viruses don’t infect humans; however, if you come into contact with infected birds or infected bird droppings, you may become infected and infect others. Symptoms of avian influenza are similar to that of seasonal flu and typically take 2-8 days to appear. Other symptoms of bird flu might include: vomiting, diarrhea, abdominal pain, bleeding from the nose, bleeding from the gums, and chest pain. Avian flu cases have been reported in Azerbaijan, Bangladesh, Djibouti, Indonesia, Turkey, Iraq, Egypt, Cambodia, Laos, Nigeria, Pakistan, Thailand, Burma (Myanmar), Vietnam, and China. Even when traveling to these places, your risk is low unless they are experiencing an outbreak of a serious strain. Viral gastroenteritis (stomach flu) – Though commonly called “stomach flu”, viral gastroenteritis is not caused by the Influenza virus. That’s right, while Avian Influenza and H1N1 are different types of Influenza, “stomach flu” is actually a completely unrelated viral infection of the stomach and intestines. People can become infected from germs in food and water, from germs on plates and silverware, and from other people who are infected. Symptoms of stomach flu are more like symptoms of food poisoning than symptoms of seasonal flu. They include abdominal pain, vomiting, and diarrhea. Like flu symptoms, though, they might also include muscle aches, fever, and chills. Treatments usually involve keeping yourself hydrated and comfortable, and the best way to avoid stomach flu is to wash your hands. 2. How do you get the flu? If you have the flu, you got it from someone else already infected, and chances are you’ve already spread it without knowing it. Since you don’t starting feeling flu symptoms for at least 24 hours after coming into contact with the virus, you can spread it without knowing. Talking? Really? Yes, even just having conversation can spread the virus. Besides just interacting with a coughing, sneezing, talking person who has the flu, you can come into contact with flu droplets just by touching high-traffic objects. 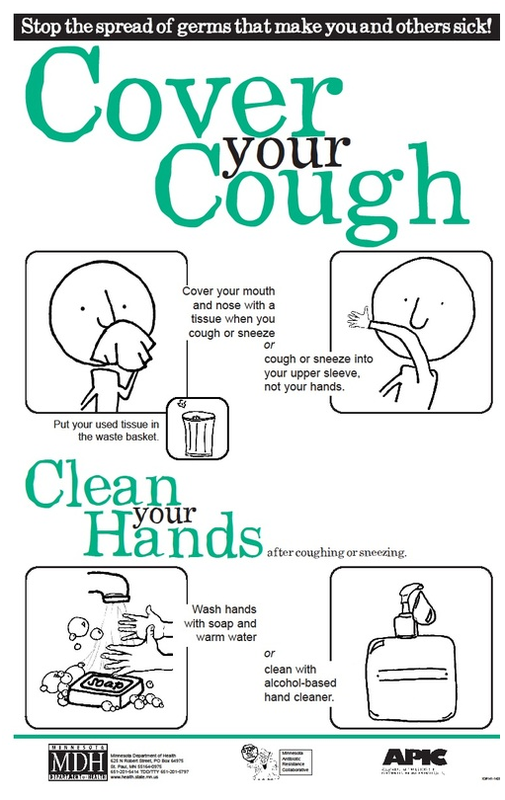 Yes, you come into contact with the flu virus by touching any of the below. “The period when an infected person is contagious depends on the age and health of the person,” The Center for Disease Control reports. “You may be able to pass on the flu to someone else before you know you are sick, as well as while you are sick.” In healthy adults, the virus is usually contagious beginning 1 day prior to symptoms starting and 5-7 days after the symptoms start. Children and people with weakened immune symptoms might be contagious for longer periods, though. 3. What are common flu symptoms? 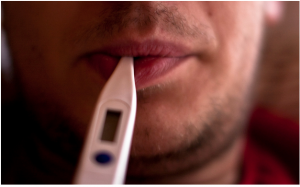 Even if you don’t have a fever, you might still have the flu. And while it’s more common in children than adults, vomiting and diarrhea are sometimes flu symptoms as well. Since cold and flu symptoms are often similar, they can be easy to confuse. Flu symptoms are usually more severe, come on more suddenly, and include the symptoms of fever, body aches, dry cough, and extreme fatigue more frequently. A runny or stuffy nose is a more common cold symptom, and cold symptoms are generally more mild than the flu. “Most people who get influenza will recover in a few days to less than two weeks,” the CDC reports, “but some people will develop complications (such as pneumonia) as a result of the flu, some of which can be life-threatening and result in death.” People in poor health, children, and the elderly are at the highest risk of developing flu complications. Contact your doctor if you notice any of the following symptoms in addition to normal flu symptoms. While he wasn’t quite advanced enough to use the metric system, his words are wise and especially applicable to flu season. Even though you can go to any physician in Niagara Falls for flu remedies, most flu treatments simply make your symptoms more bearable and the duration of your illness a little more bearable. The best way to treat the flu is to prevent it. Wash your hands. Remember, one of the principal ways that the flu virus spreads is through touch. Disinfect high-traffic objects. Doorknobs, television remotes, phones, light switches etc. All of these objects stand a high chance of carrying flu droplets. Practice proper sneezing and coughing. That’s right. There’s a right and wrong way to sneeze, and if you think about how the flu spreads through “droplets” it makes sense that keeping your coughs and sneezes to yourself would keep you from spreading the flu. Remember, you can spread the flu for a whole day before you start feeling symptoms, so watch out for your friends and relatives. Sneeze and cough into a bent arm to ensure your “droplets” stay with you. Get plenty of rest. Harvard Health advocates “adequate sleep” as one of the best things you can do to give your immune system “the upper hand”. Eat healthy foods and exercise. One of the best ways to keep your body healthy during flu season is to take care of it. A healthy lifestyle helps keep you healthy during flu season. The Canadian government has stated, “The best way to prevent the flu is by getting a flu vaccine, also known as a flu shot.” It recommends flu shots to everyone 6 months or older and this is the number one way to prevent the illness. In 2014, Harris/Decima performed a poll for The Canadian Press showing that adults aged 18-34 and people with children in their homes were becoming more convinced of the efficacy of flu shots. 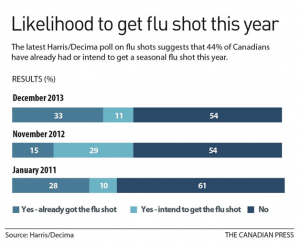 In fact, by December of 2013, 44% of Canadians reported that they already had or intended to get a flu shot. This is a good trend, and it’s something Niagara Falls doctors are happy to see. However, because many people don’t know the facts about flu shots, many people are nervous about them. That’s understandable — It’s not wise to let someone inject you with a substance you know nothing about, even if it’s a reputable physician in Niagara Falls. 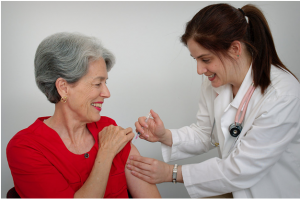 We’ve compiled a list of flu shot facts to answer some common questions you might have. Is the flu vaccine a live virus? The short answer is the flu shot is not and the nasal spray vaccine is. Flu shots contain an inactive (dead) virus. Flu nasal vaccine contains a weakened virus that only causes infection in the cooler temperatures of the nose. However, since the virus in the shot is inactive, you cannot get flu from a flu shot. Can you get the flu shot if you are sick? One Medical Group advises, “If you think you’re coming down with a bug, and especially if you have a fever, we recommend waiting to get the flu vaccine until you’re feeling better.” The flu shot works by enticing white bloods cell into laying a sort of “groundwork” for the real virus. 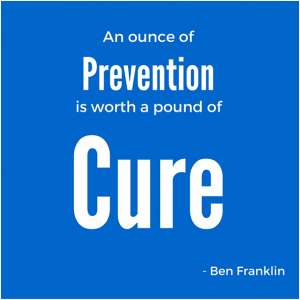 It won’t work as a treatment, but only a preventative measure. Think of it like working out for a competition — It helps in the weeks prior to the event, but it’d be pretty useless and even detrimental the day of the event. Can you still get the flu after having a flu shot? “It takes a week or two to get protection from the vaccine,” Harvard Health reports. If you think you were exposed to the virus prior to being vaccinated, they recommend that you consider taking antivirals. While the flu shot is an effective defense against the flu, you should still avoid contact with people who have the flu, as the defense isn’t bulletproof. What are effective flu remedies? If you do get the flu, most flu remedies exist to make you more comfortable and can’t really affect the illness. The Canadian board of health recommend resting, drinking plenty of fluids, and taking medication to reduce any fever or aching. 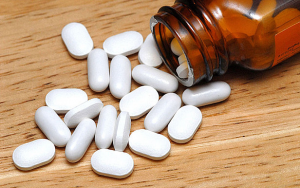 One treatment that does combat the illness is antivirals. You can talk with one of our doctors in Niagara Falls for prescriptions for these antivirals. If you’ve ever had the flu, you know that shortening that illness by even a couple of days is worth it. While flu season can be an uncomfortable and inconvenient, it’s not something you have to be afraid of. By staying informed, practicing a healthy lifestyle, and taking preventative measures, you should be able to take on this flu season without fear. Sweet blog! I fouund it while browsing on Yahoo News. Pretty! This has been an incredibly wonderful post. Maany thanks for supplying this information. Niagara on the Lake and surrounding areas.